The major platform Dongguan vigorously promoted Cross-Straits Biotech Industry Cooperation Base (BIOCEAN) has gathered 140 biotech enterprises specialized in new drug development, medical equipment, Chinese patent medicines, in vitro diagnosis, pharmaceutical manufacturing, health products and bio-enzymes, including HEC Pharm, Fapon, Capital Genomics and Hongshanhu. The clustering effect of the Base has started to show. 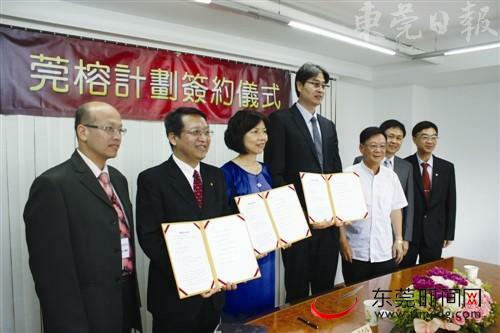 After prudent and rigorous selection, Dongguan City Biotech Industry Development Co., Ltd. and GeneFerm signed the Guanrong Program Cooperation Agreement on June 24, 2014. An owner of advanced core technologies in bacteria screening, fermentation, recycling and purification, GeneFerm is Taiwan s largest fermented and extracted health product manufacturer. Now signing the agreement to enter the Cross-Straits Biotech Industry Cooperation Base, GeneFerm will take it its business headquarters for future development. Since the implementation of innovative Guanrong Program in 2014, the Base has drawn quality Taiwan biotech enterprises like MiiS, Abnova and GeneFerm. Listed, OTCBB and emerging enterprises like Sunmax, Taihe, Biontech, Biodenta and Naturewise have explicitly expressed their interest in joining the Guanrong Program. In the future, these Taiwan biotech enterprises will make a wonderful view in the Base. Under the comprehensive operation of Dongguan City Biotech Industry Development Co., Ltd., the Base has introduced and established a number of biotech industry public service platforms. With such biotech teaching and research institutions like Guangdong Medical College, South China Institute of Collaborative Innovation, Mathematical Engineering Academy of Chinese Medicine, Institute of Dongguan Jinan University, Institute of Dongguan Sun Yat-sen University and Laboratory Animal Base of Southern Medical University, a supporting chain of biotech industry with scientific research capacity has been preliminarily formed. Ranger Analyticals Public Technology Platform invested and established by Dongguan City Biotech Industry Development Co., Ltd. provides bioanalysis, preparations, physical and chemical testing services for biotech enterprises. These public platforms can provide technical support for biotech enterprise, create an ideal environment for industrial development, and facilitate the sound and orderly development of biotechnology. According to Song Tao, adviser to Dongguan Municipal People s Government and chairman & general manager of Dongguan City Biotech Industry Development Co., Ltd., recent years have seen the rapid development of biotechnology and biotech industry globally and major developed countries vigorously developing bioindustry. As biotechnology has become a focus of modern technological research and development, the development level of bioindustry directly manifest the economic and technological level of a country or region, and constitutes a major field of future sci-tech economic competition. Long committed to the development of bioindustry, China plans to make it a pillar industry in national economy by 2020. The bioindustry is estimated to grow into one of China s largest industries within the next 15 years. At the end of 2012, Dongguan Municipal People s Governance announced its decision to set up the Cross-Straits Biotech Industry Cooperation Base to fully advance the development of bioindustry and strongly support the economic transformation and upgrade of Dongguan. Song Tao revealed that the Base would further innovate in operation mechanism and working procedures, enhance service ability, and increase efforts in investment attraction with the support of the Municipal People s Government and Songshan Lake (Biopark) Administrative Committee. The construction of bioindustry public service platforms, bio-product sales channel networks, industry funds and investment and financing platforms, registration application service systems will be advanced and improved for the development of bioindustry. Industry resources will be integrated and bioindustry chain extended to connect R&D, production, circulation and utilization and thus enhance the operating efficiency and benefit of bio-enterprises, improve the independent innovation ability and supporting ability of the industry and advance the rapid development of the Base. Meanwhile, the construction of business and commercial supporting facilities will be accelerated to make Songshan Lake and the Base a fertile land of startups and a livable town. It s hoped that it will become an entrepreneurial paradise, a Silicon Valley-like park and a delightful town for science, technology, production and living.